All products are 100% natural, reusable, decomposable washable. We have latest Drying Machines configured to care for better Drying. We use Tumble Dryers. Tumble Drying is done to remove excess moisture from the Fabric. Heat Air is circulated through the rotating drum to evaporate moisture. In order to keep pace with never ending demands of clients, our company offers Cotton Backpack Bag. Samsonite provides plenty of options in its backpack range; choose the backpack that is most comfortable to you, from our array of bags that includes casual backpacks, laptop backpacks and rucksacks. To buy backpacks online in India visit our official retailer – bagzone.com. These designer school bags come with an attractive finish appeal that makes them the first choice of school going children. 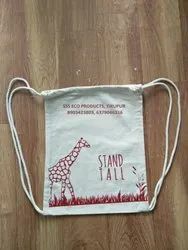 The use of bright colors & printing of logos and known animated characters as well as superior machine stitching for carrying the book load also added in designer school bags for their attractive finish quality.